This month’s featured artist is someone close to me. A blogger, an artist and a friend. She’s the person behind The Sab Stuff. Get to know about her more here. 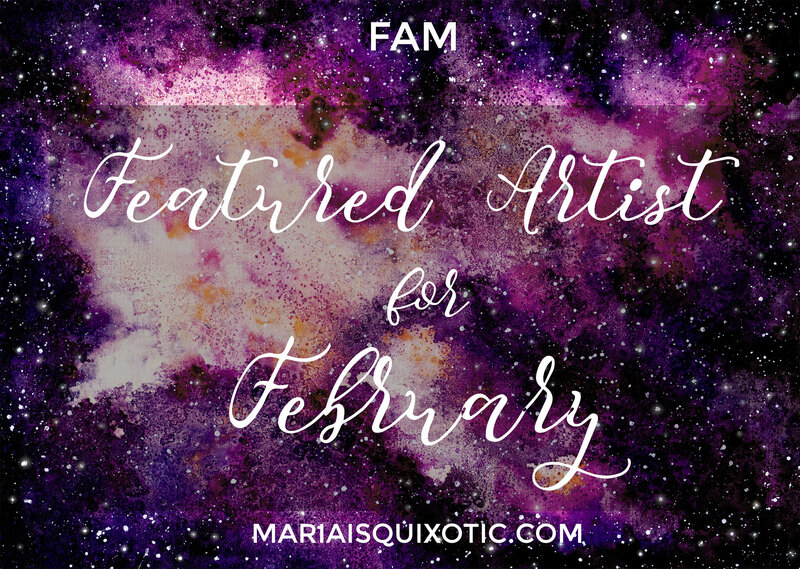 The person behind The Sab Stuff is the featured artist for this month. She’s none other than Sabrina “Sab” Escoto. It’s going to be a lengthy story of how exactly we met. It started when she was still more active in the blogging scenario and would attend events and actively wrote about things. I guess it started with a specific thread on a certain community and she saw my profile and asked something about another thing. From there on, we started conversing. First, it was about blogging then it went to the arts and eventually with calligraphy. Let’s get to know her more and her artsy journey. I’ve been doing lettering since I was in elementary. I always found joy in making beautiful letters. I started calligraphy mid 2014, I was going through a tough time when all I realized that I needed an outlet. Before calligraphy, I would just doodle random things whenever I’m sad (see my IG.) but I came across a post on FB, some beautifully written words in script. That’s was when I grabbed my gel pen and my paper, that was when I realized that my passion is making letters dance. I pursued it because I know that day by day I will get better. I pushed through will calligraphy because I know that there are people who get inspired with the things that I write. Yes, of course, there will always be struggles. First, I never thought I would be good. Until now, I find imperfections with my works but that just makes me want to do it more. It makes me want to get even better. Second, there will always be competition. There were people who tried to sabotage me but I’ll never let them pull me down. Follow my blog and like The Sab Stuff on Facebook for your daily dose of calligraphy 🙂 haha! kidding aside, just practice. Your friend Sab is so talented. Love her calligraphy. And love the inspiring words he shared. I always wish I will be that good at calligraphy and yet I do not do something to improve myself. I always do not find time to practice though I often tell myself I would. I should really push myself to make time for it. I also love her quotes. Truly inspiring. I heard about Sab via a friend. She’s really popular right now because of calligraphy. And she even holds calligraphy workshops according to the friend of mine. Is it true that she already quit her job to do it full time? I’m sure she’s inspiring a lot of people right now. The calligraphy is beautiful! I feel like I’ve learned a lot about calligraphy from reading your blog. And it’s nice that you decided to feature your friend Sab! I also like her advice about practicing. Wow! I took time to check on her instagram and her works are all gorgeous. Wow just wow.. It makes me want to scribble again.. I tried calligraphy once, but I never succeeded with this hobby haha! Sad to say, I discontinued practicing it. She’s very talented, makes me want to check and follow all her accounts. I love her calligraphy! She’s really good at it, it looks wonderful. Glad to see it here. And she’s only been doing this for 2 years? great! ‘Don’t rush’ is a good tip! I always tend to think I need to learn everything overnight haha. I like those quotes on her IG. 🙂 Very inspiring quotes! I believe in them. I can relate to her. I also continue writing because I know that there are people who are inspired and helped by what I write. Wow Sabrina is really a talented artist, I love her calligraphy and watercolor work, it’s something that I can never stop admiring. As a designer, anything related to typography and arts will surely get my attention. am seriously fan-girling right about now! 🙂 i have a very deep respect for calligraphers as i am incapable of churning out anything pretty 🙂 apart from creativity, I can only imagine how much patience and discipline such craft entails. I’m in love with the layout of your blog. Really liked this article, Sabrina sounds such a cool person! I love calligraphy (maybe because I would never be able to do it?). It’s so creative and it needs so much patience!